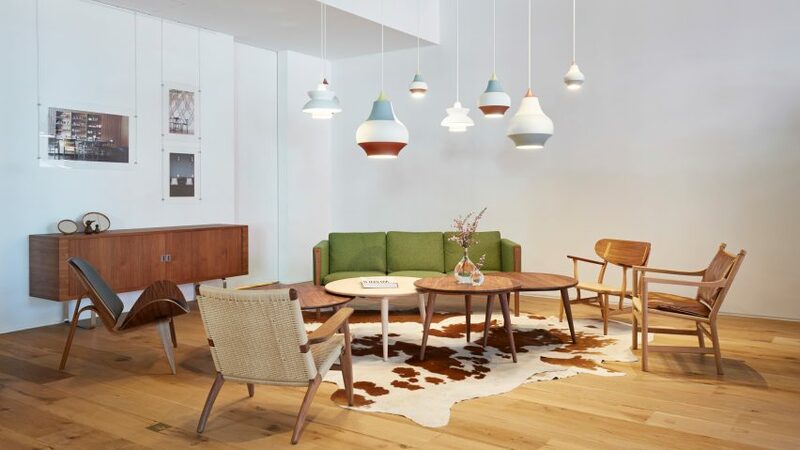 Mid-century Scandinavian and Californian design meet in Carl Hansen & Son's new showroom in San Francisco, which the Danish furniture brand has opened to continue its US expansion. Carl Hansen & Son's West Coast flagship store occupies a ground-floor space in the city's Design District – a hub for homeware and furniture brands close to the South of Market and Mission neighbourhoods. The company previously operated a store in Los Angeles, but decided it would have more success in the Bay Area, so moved to a larger and more prominent location. The flagship joins the brand's New York location, which was similarly relocated and expanded last year, as it aims to capitalise on the American market. "San Francisco has long represented an intersection of international ideas and values, and combined with the city's reputation as a design destination, provides an ideal backdrop for our first ground level retail location in the US," said CEO Knud Erik Hansen. "Our exceptional furniture is rooted in a tradition of collaboration with pioneering designers, and that philosophy finds excellent synergy in San Francisco." Carl Hansen & Son describes the aesthetic of the store as a blend of Danish minimalism and Californian modernism. Measuring nearly 200 square metres, it features high ceilings with exposed fittings and a backdrop of white-painted walls and wooden flooring. This creates a light and airy setting similar to the loft style of the New York location. Furnishings on show include the brand's collection of pieces by well-known mid-century Danish designers like Hans J Wegner, Kaare Klint and Arne Jacobsen. A simple material palette of white oiled oak and walnut, and muted hues of pink and green, are used for the display. There are two main exhibition spaces within the showroom. Lit by a large street-facing window, the main area is open plan and arranged as a series of room-like setups, including a kitchen, a living area and two wooden dining tables. A pair of Ole Wanscher's 1949 colonial chairs are placed in the lounge, while the CH23 dining chair by Hans J Wegner – which the brand relaunched last year – is among a mix of seating at the dining tables. Pieces by Poul Kjærholm and Frits Henningsen join the range of iconic mid-century designs, alongside the brand's collaborations with contemporary designers Naja Utzon Popov, Anker Bak, and Japanese architect Tadao Ando. In the kitchen, a custom-built island is made from wooden bookcases designed by mid-century Danish architect Mogens Koch. Koch's design is also used to form shelving, used as a library of books celebrating Carl Hansen & Sons' heritage and as a divider for the second exhibition space. This area is focused on celebrating traditional Danish craftsmanship. It contains a display of chairs that includes Kaare Klint's 1914 Faaborg Chair, which is regarded as the "first Danish modern design classic". "The new flagship store has been thoughtfully framed to serve as an inspirational and memorable resource for myriad stakeholders in the realm of design – to cater to the unique needs of a contract professional's specifications, as well as the private customers process of discovery," said Hansen. Carl Hansen & Son's US expansion follows a suite of European brands similarly finding success across the pond. British designer Tom Dixon has also expanded his retail offering to both US coasts, while Moooi, Arper and Lee Broom have all opened showrooms in New York in recent years.